-Insect Repellant and Sunscreen: For those bridal party shots hot summer days. -Umbrella: We really don’t want the weather to ‘rain on your parade’ on your wedding day. -Blister Pads: Let’s be real, your wedding shoes may not be the most comfortable, but they sure are the cutest. -Sewing Kit: That one button or clasp that will not stay in place. We’ve got you! -Antiperspirant spray: Perfect for sharing amongst the whole wedding party without the gross factor. -Allergy-friendly Granola Bars: We don’t want anyone getting hangry… Am I right? -Mints and Listerine Breath Strips: For a blast of freshness before that first kiss or mingling with your guests during the receiving line. -Hand Lotion: For those close ups of your new bling. -Hairspray: You’ll need it! Little known tip, a fresh toothbrush is about the best precision comb there is for stubborn flyaways. -Q-Tips Precisions Tips Cotton Swabs: In case you run into any makeup mishaps. -Tide To Go Stain Remover Pen: Sometimes the party gets a little crazy! 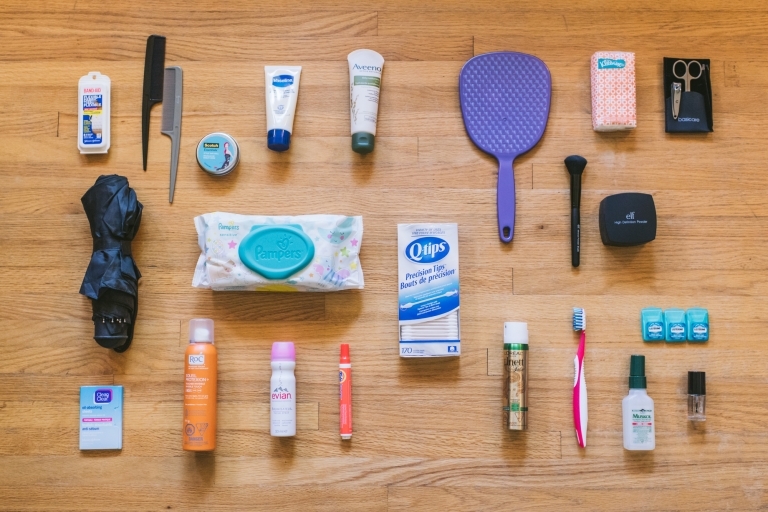 A few other items we carry in our stash include nail polish, HD powder, bandaids, wipes, feminine hygiene products, chalk, safety pins, bobby pins, fabric tape, floss, oil absorbing sheets, superglue and more. Beauty Blender: A staple beauty tool to have in your kit on your big day! Super easy to use after you’ve shed a few tears while saying, “I do.” We recommend you bring your own and not use one of your bridesmaids’ as they are an item that absorbs bacteria. As the lifespan of a beauty blender is only 3 months, we recommend using a beauty blender cleanser so that your beauty blender is fresh and ready to go for your wedding day. Comfortable Shoes or Slippers: We know you’ve picked out the perfect pair of heels or flats that go with your bridal gown, but standing on your feet all day is rough (trust us, we know) and one of the most important things on your wedding day is that you’re comfortable! Bring an extra pair of flats or sandals that you know you can count on to dance the night away in. Powder Brush: We mentioned a beauty blender earlier but a powder brush is perfect for those moments throughout the day when you and your new groom are getting a bit oily. Bring along your translucent powder or loose powder to sweep across your T-zone when your natural oils start showing up to the party. Concealer: Touch ups wouldn’t be the same without your go-to concealer. Need a little brightening under the eyes or the stubborn blemish that showed up the morning of your wedding day needs to be hidden? Concealer is your answer (that is however if Windex didn’t work…*cough My Big Fat Greek Wedding cough*). Extra Dress: As crazy as it sounds to bring another dress with you, we have been in situations where the bride needed another dress! The likelihood of this happening to you is, of course, low, but in the event that it does happen, you’ll be thanking your lucky stars that you decided to throw that cute white dress that you bought “just in case” in a garment bag. Favourite Curler/Straightener: There’s nothing like your own styling tool close at hand; knowing how the curls turn out when you use it is key to feeling 100% if a pesky curl decides to fall flat. Lipstick/Lipgloss: We know you probably have your go to lipstick or lipgloss with you in your purse even when you’re heading out for an evening, so there’s no doubt you should have it in your kit for your wedding day. Toothbrush/Toothpaste: When a breath mint just won’t do the trick. Hey, it’s a long day! Medications: Make sure you have all of the medications with you that you might need. Earrings: With all the movement on your day, there’s a chance you could lose an earring. Have an extra pair stashed in your kit that you’re equally as happy with in the event you lost an earring. 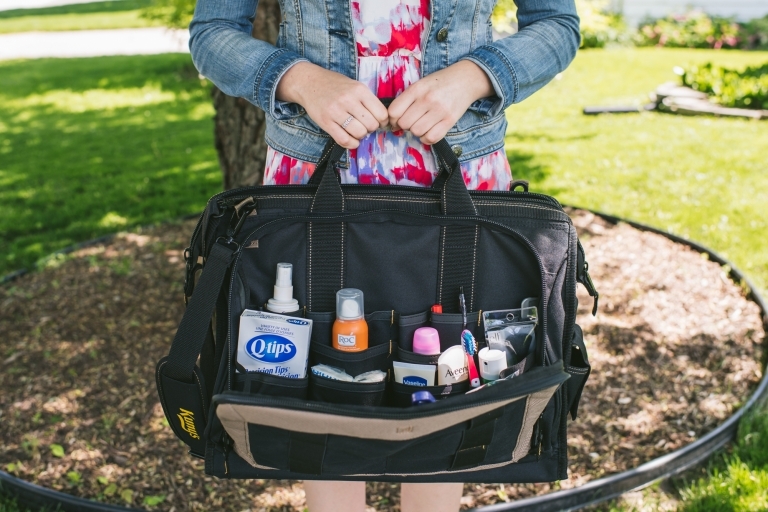 We hope you feel at ease knowing we’ll be with you every step of the way, emergency kit in tow. There are always things that are going to come up and we can all try to be as best prepared as possible for them, but at the end of the day, there’s only one thing that matters… That you married your best friend!